توسان لوورتیور (انگلیسی: Toussaint Louverture؛ ۲۰ مه ۱۷۴۳ – ۷ آوریل ۱۸۰۳(1803-04-07)) سیاست‌مدار اهل هائیتی بود. وی از سال ۱۸۰۱ تا ۱۸۰۲ رئیس جمهور کشور هائیتی بود. ↑ Stephen, James (1814). 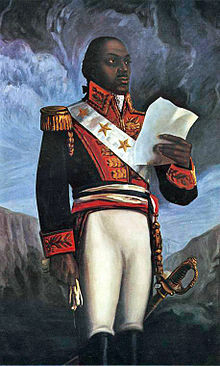 The history of Toussaint Louverture. Butterworth and son. p. 82. ↑ Taylor, David (2002). "Martini". p. 95. ISBN 1-930603-03-7. ↑ Knight C., ed. (1843). "The Penny Cyclopædia of the Society for the Diffusion of Useful Knowledge; Volume 25". p. 96. Retrieved 15 December 2015. ↑ Henri Christophe (King of Haiti) (1952). Griggs, Earl Leslie; Prator, Clifford H., eds. "Henry Christophe & Thomas Clarkson: A Correspondence". University of California Press. p. 17. Retrieved 15 December 2015. ↑ Fombrun, Odette Roy, ed. (2009). "History of The Haitian Flag of Independence" (PDF). The Flag Heritage Foundation Monograph And Translation Series Publication No. 3. p. 13. Retrieved 24 December 2015. در ویکی‌انبار پرونده‌هایی دربارهٔ توسان لوورتیور موجود است. این صفحه آخرین‌بار در ‏۶ سپتامبر ۲۰۱۸ ساعت ‏۱۲:۱۹ ویرایش شده‌است.